Younger Millennials (ages 18 to 24) are much more likely than older ones (ages 25 to 31) to be living with their parents—56% versus 16%. Since the onset of the 2007-2009 recession, both age groups have experienced a rise in this living arrangement. Declining employment. In 2012, 63% of 18- to 31-year-olds had jobs, down from the 70% of their same-aged counterparts who had jobs in 2007. In 2012, unemployed Millennials were much more likely than employed Millennials to be living with their parents (45% versus 29%). Rising college enrollment. In March 2012, 39% of 18- to 24-year-olds were enrolled in college, up from 35% in March 2007. Among 18 to 24 year olds, those enrolled in college were much more likely than those not in college to be living at home – 66% versus 50%. Declining marriage. In 2012 just 25% of Millennials were married, down from the 30% of 18- to 31-year-olds who were married in 2007. Today’s unmarried Millennials are much more likely than married Millennials to be living with their parents (47% versus 3%). These three compositional changes do not explain all of the increase in living at home since 2007. A Pew Research trend analysis shows that within each of these growing demographic sub-groups — the unemployed, college students and the unmarried – a higher share of young adults were living in their parents’ home in 2012 than in 2007. Looking at longer term trends, the analysis finds that the share of young adults living in their parents’ home was relatively constant from 1968 (the earliest comparable data available) to 2007, at about 32%. However, other household arrangements of young adults changed dramatically during this period. For example, the share who were married and living with a spouse fell from 56% in 1968 to 27% in 2007. And the share who were living with a roommate or child or were cohabiting with a partner increased nearly fivefold (from 5.5% to 26%). 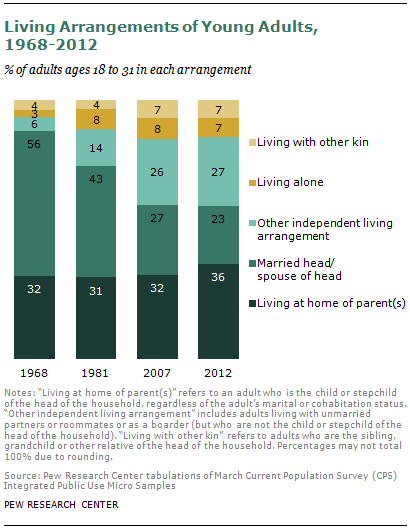 This analysis of young adult living arrangements is based on the March Current Population Survey (CPS). The specific files used in this report are from March 1968 to March 2012. Conducted jointly by the U.S. Census Bureau and the Bureau of Labor Statistics, the CPS is a monthly survey of approximately 75,000 households (in March) and is the source of the nation’s official statistics on unemployment. The CPS is nationally representative of the civilian, non-institutionalized population and therefore does not include people living in institutions or armed forces personnel (except those living with their families). Because individuals residing in group quarters are sampled as individuals in the CPS, it is not possible to establish relationships or co-residence for persons in group quarters. Therefore, the analysis is restricted to young adults residing in households and excludes those in group quarters. However, this is not an important restriction because most young adults residing in non-institutional group quarters live in college dormitories. In the CPS, college students in dormitories are counted as living in the parental home. The report was written by senior economist Richard Fry. Paul Taylor, executive vice president of the Pew Research Center and director of the Social & Demographic Trends project, provided editorial guidance. Kim Parker, associate director of the Social & Demographics Trends project, assisted in the editing. Eileen Patten, research analyst, assisted in formatting the charts and document. Anna Brown, research assistant, assisted with number checking. Marcia Kramer of Kramer Editing Services copy-edited the report. Following prior Pew Research practice, a “Millennial” refers to an adult born after 1980 (Pew Research Center, 2010). In 2012, Millennials were 18 to 31 years old. A young adult refers to an 18- to 31-year-old. An adult is considered to be “living at home” or “living with parents” on the basis of the adult’s relationship to the head of the household. The adult is living at home if and only if the adult is the child or stepchild of the head of the household. So, for example, for a married couple residing in the house of the husband’s mother (and the mother is the head of the household), the husband is considered to be living at home. Alternatively, if the husband is the head of household (and thus owns or leases the dwelling), he is considered to be living independently and is not living at home (regardless of the presence of his mother). An adult is “living with parents” if at least one parent resides in the household. Both parents do not need to be present. A “college graduate” refers to a person whose highest education is at least a bachelor’s degree. Prior to 1992 it refers to a person who completed at least four years of college.